Manatee swimming, fishing, scalloping, relaxing....no better place to come and enjoy all Citrus County has to offer! Just check out our many reviews, our guests have been returning again and again. For 20 years we have been hosting guests and providing a wonderful way to explore all Crystal River has to offer. Dock your boat on our seawall with your own personal mooring whips. Paddle just 5-10 minutes to Kings Spring or 15-20 minutes to Three Sisters Spring with your own private kayaks and paddle board we offer at no additional charge. Bike around downtown and do a little shopping on your own set of bicycles we also offer at no additional charge. We are situated nearly right on Kings Bay, just 1 house in on a freshwater canal. Come visit Florida's Nature Coast in our brand new remodeled interior from floor to ceiling. Our relaxing vacation home is featured on an over-sized corner lot that is approximately 3/4 acre. The lot is fenced and full of shade trees. Our home is a spacious two bedroom, two bath space with an additional Queen sleeper sofa. It comfortably accommodates 6 people. 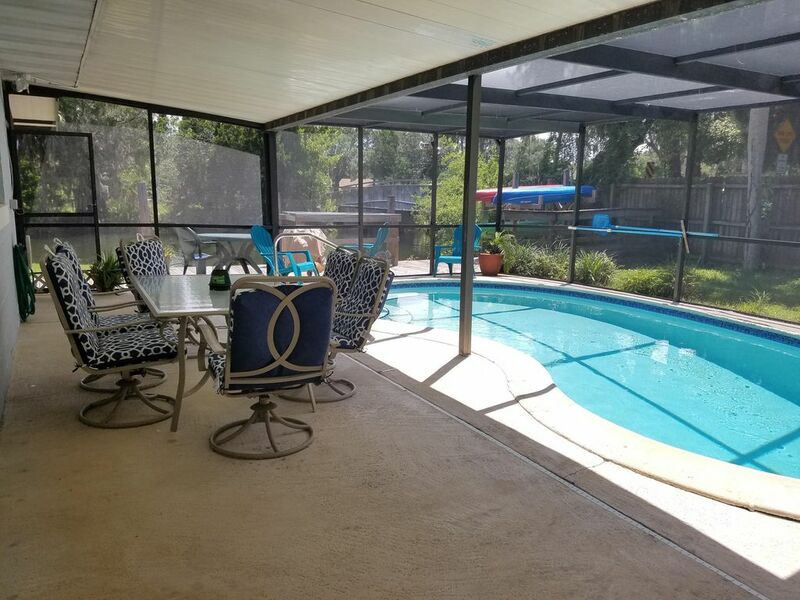 Aside from the open tiled kitchen/living/dining area, we have an enclosed Florida room, a screened in patio, and a screened lanai with a private pool. We offer cable t.v., wireless internet, and dvd players for your use. Our visitors enjoy the tranquility that our home offers. It is very common to see manatees slowly making their way through our canal along with an occasional dolphin or otter sighting!! There are several species of birds that come to feed in our yard that can be viewed through our comfortable Florida room and back screened patio. This home is located near the end of a quiet cul-de-sac in a residential neighborhood. We have plenty of room to park your vehicles and boat trailers in the long driveway or in the yard. There is also a covered carport for your vehicle. We do offer 3 single seater kayaks and a paddleboard here at the home at no additional cost to you, along with paddles and life jackets. We also provide 2 beach cruiser bicycles at no additional cost. We have a crabtrap in the back you can use as there are several blue crabs in the canal. There is also a fish cleaning table in the back in front of the boatslip. The home comes completely stocked with kitchen utensils, cookware, bed linens, towels and washcloths, soap and cleaning materials. There is a full washer/dryer here for your use and we keep you stocked with laundry detergent. All you need to bring are your personal toiletries and food!! There is a county boat ramp with rest rooms and picnic area about 4 miles down Fort Island Trail. Fort Island Gulf Beach is 6 miles away on Ft. Island trail. The area is perfect for swimming with the manatees and swimming in nearby springs. 3 Sisters and King spring are within paddling distance. Please feel free to ask us any additional questions you may have regarding our home or the area. We do offer a 10% military, police, ems, fire and return renter discount. Our home is open all year long for rental. Thank you and we hope to hear from you! Bob and Ramona Kennedy first came to Crystal River in 1969 and knew King's Bay was the slice of heaven they were looking for to live and love and raise their 3 boys. In 2001, their offspring, the 3 Kennedy brothers decided to go in on a joint venture to share the beauty, fun, and adventure they experienced growing up on Kings Bay. There have now been 3 generations of Kennedy's raised here! This home and property is truly a gem - from the spreading arms of our giant oak, to the gentle tides flowing in and out in the canal in the back yard, this space provides instant peace and tranquility. Manatees are often seen in the canal behind the house. Otter, Dolphins, and many types of fish can also be viewed swimming by. Fish from the seawall as well as crab. Birdwatching can also be enjoyed here. Resides on Bay end of canal 50 yards from Kings Bay. All bed linens and spare sets furnished. Wireless modem connected to fixed modem. Built-in. Disposal grinder in sink. Table and chairs in screened area. Not allowed indoors/Florida room. Outside only. NOT HEATED. Screened in with table and chairs. This is such a terrific place to stay when you're visiting Crystal River. It's got such a welcoming open plan, big kitchen and terrific porches. It's super clean and well kept. The back yard is on a canal - that is a canal with manatees coming right up to feed. It's in a quiet neighborhood, yet very close to town. This property is exactly as the photos depict. It’s comfortable, clean, and well equipped including kayaks and bicycles, both of which we used. Owner is VERY responsive and pleasant. The property has a nice screened in porch overlooking the canal which was a very peaceful place to sit and drink our morning tea/coffee. Several birds, including blue herons and egrets joined us. Location is two houses off of Kings Bay so location is easy for kayaking where we were graced with manatees swimming along side us. Cycling to the beach is easy as it’s only about 7 miles of flat road with a bicycle lane to the beach. All -in -all it was a perfect get away. The only cons I would have are the lack of towel racks and one of the bicycle seats needs some attention. We had the best time in our three short days. The location is so perfect. We loved taking the kayaks out and exploring. The wood stork that visited us for dinner was always a treat! And the last morning there - we saw dolphins just outside the canal!!! The house was comfortable and inviting. It truly felt like a home away from home. My dogs loved running in the yard and around the pool. Just one very minor word of caution - if you have small dogs, they can slip under the fence if they want to. Mine did ... but came right back. Just be sure to watch them. 😁 we had a great time and time and the house was perfect! I cannot wait to go back! We had never been to this area before and absolutely LOVED it. The home is beautifully renovated on the inside and super clean. All linens are provided which makes for easier packing. It was amazing seeing all the dolphins and manatees right next to our kayaks. Our daughter had a wetsuit of her own. We might invest in ones for ourselves if we return, so we can tie up our kayaks and swim in 3 sisters springs. The house was great and the patio spaces were great for water watching. A couple of minor conveniences, such as towel bars, a chair in the master bedroom and instruction manuals for the house electronics would complete the property. Home is well maintained and comfortable in a quiet neighborhood. We took a day trip to Hunter Springs where the sandy beach is perfect to launch a kayak or bring the kids to swim. Service fees will be omitted if paid by personal check. Rates are subject to change. Rates confirmed at reservation with security deposit received. Owners reserve the right to cancel reservation at any time. Owners reserve the right to schedule property repair or maintenance at any time.